Click Options > XML Formatting... to specify how XMLBlueprint should format your XML Document. • <element xml:space="default"> -- Whitespace within the element (and its child elements) is insignificant and may be formatted. • <element xml:space="preserve"> -- Whitespace within the element (and its child elements) is significant and will not be formatted. 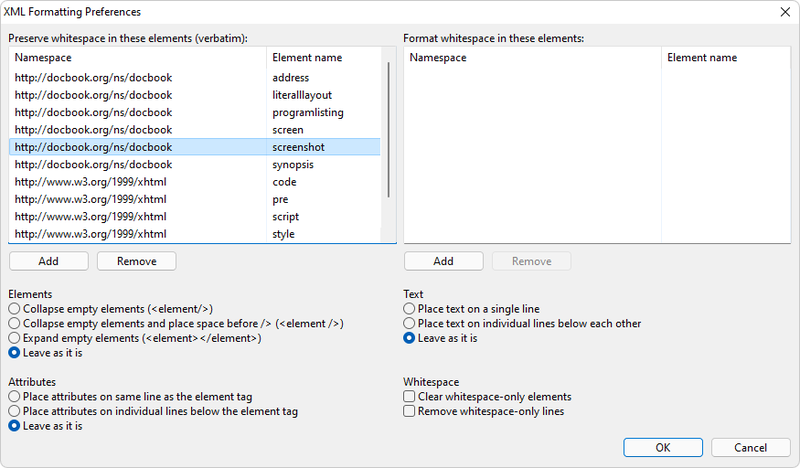 Preserve whitespace in these elements ("verbatim") -- Elements in this list are formatted as if they have an attribute xml:space="preserve". Format whitespace in these elements -- Elements in this list are formatted as if they have an attribute xml:space="default". • Leave as it is -- Empty elements are not formatted. • Leave as it is -- Attributes are not formatted. • Leave as it is -- Text is not formatted. • Clear whitespace-only elements -- Elements with only whitespace (newlines, spaces and tabs) are cleared and then formatted as an empty element. • Remove whitespace-only lines -- Lines with only whitespace (spaces and tabs) are removed.